PACIFIC HOUSE is an Architecturally designed sophisticated and stylish brand new house, sitting perfectly between Oneroa and Palm Beach. From the huge decks you can capture glimpses of the sparkling sea in Oneroa Bay. The property is nestled in a gorgeous bush setting with the privacy and tranquility of a secluded location but conveniently located for easy access to Oneroa - (approx 1 min drive) The house is beautifully furnished and boasts two spacious living areas and a well-equipped brand new kitchen and three spacious bedrooms inside and a further exterior double room accessible v,ia the downstairs lounge. offering plenty of space for a large group or 2 families. Designed grounds including flat grassed area for the children to play on - and a terraced spa area. 1. Master bedroom with Queen bed and ensuite. 4. Bedroom 4 with a double bed - own exterior entrance. Spacious open plan contemporary split level property. 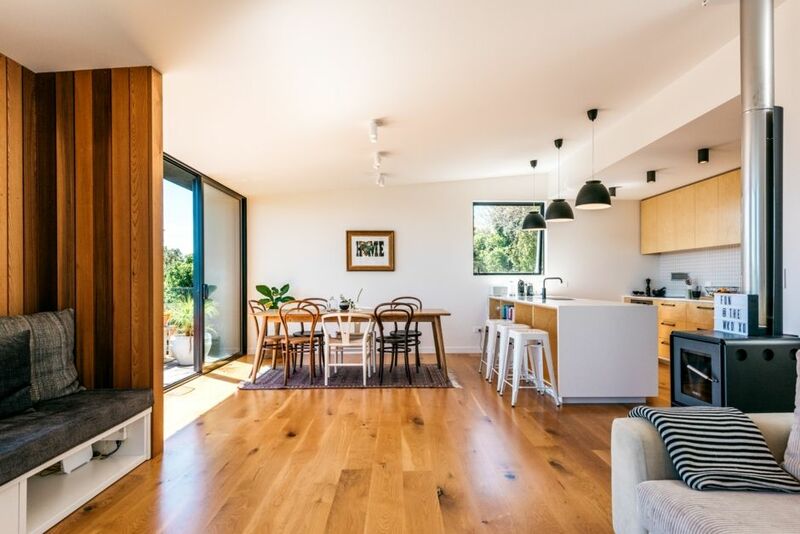 an open plan fabulous kitchen, dining and lounge which opens out onto large decks with a relaxing expansive outlook. Easy walking distance to two beautiful beaches Little Oneroa and Oneroa. Oneroa Village is a 15 min walk..
Short drive to vineyards, restaurants and all Waiheke has to offer. Enjoy the private views looking out to Rangitoto and the tranquility of the native tree lined valley it sits above. The property may not to be used for are gatherings, parties or weddings. No pets allowed at this property -but pets have been at the house. The house is beautiful and everything was to a very high standard. The house is beautiful and everything was to a very high standard. The only thing to be aware of is that the fourth bedroom is very small, really only suited to one person not a couple. But a very minor complaint in an otherwise perfect holiday. The location was perfect. It’s about a 15-20 min walk to Oneroa & the beach is just under 10 mins away. The property was beautifully presented and clean. There was lots of space as we were 3 families. The house only has 2 bathrooms and a powder room not 3 full bathrooms so something to note. We had an issue with a smell coming from the sewerage tank which Penny responded to straight away however this seemed to be an ongoing issue and noticeable when outside. Loved our stay.